Wow, what a year! First, business is doing really well. I’ve had the opportunity to photograph more people, clients and friends, than in any year previous, my wife and I celebrated our tenth year together and, now, my second provincial Portrait Photographer of the Year title (the first being in 2012: London Photographers | Portrait Photographer of the Year), which I received at Focal Point 2016 in Toronto. Heading into this year’s image salon, I had some specific ideas in mind that I really wanted to try out. First, my child portrait “The Bashful and the Brave”. It didn’t fare well in last year’s provincial salon, so I took the judge’s advice, made the appropriate adjustments and re-entered it. 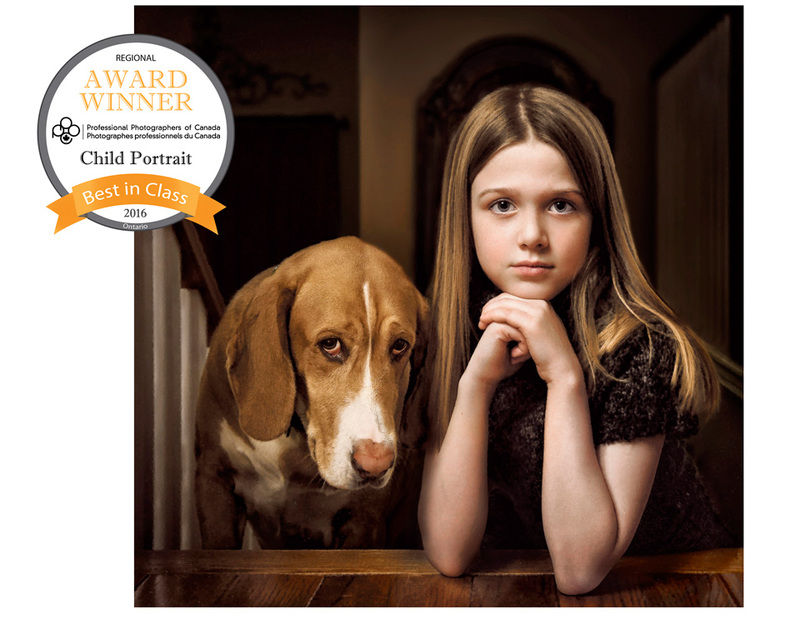 Persistence pays off – as does listening – and it took Best in Class for Child Portrait. That one, more than the rest, meant a lot to me as little Taylor’s best bud Sophie passed away just a couple of weeks before this image was judged. My Fine Art entry, “Bethany’s Waltz”, was accepted into the salon, as was “Only One Of Us Walks Away” (any Slipknot fans reading this? You’ll recognise the line …), which was a finalist for the top Portrait award. My other water themed concept “Waterborne” took Best in Class for Figure Study, and I want to give a shout out to Echo for her assist on lights the day I made that image from atop a little bridge over one of the Thames River tributaries. Echo 1, river 0. Toronto, ON – The 2016 Image Salon for the Ontario region of the Professional Photographers of Canada was exhibited this week during Focal Point, the annual conference of the PPOC – Ontario in Toronto, Ontario. Jay Terry, MPA LPPO , a professional photographer from London, ON was honoured as Portrait Photographer of the Year. He was awarded Best in Class – Figure Study for his image titled “Waterborne” and Best in Class – Child Portrait for his image titled “The Bashful and the Brave”. “Waterborne” also received a Judge’s Choice Award. Jay had 4 images accepted and exhibited in the Ontario Image Salon, judged prior to the conference by a panel of master photographers from across Ontario. Acceptance into the salon is an indication of the makers’ ability to produce outstanding images for their clientele. The competition features entries from across Canada in twenty-one different classes, including press, portrait, architecture and fashion. or email her at: exec.director@ppoc.ca. This entry was posted in News and tagged Best in Class, Child Portrait, Figure Study, London, Model, Models, Ontario, PPOC, Photographer, Portrait, Professional, Waterfall, child, competition, dog, image, judge's choice, kids portraits, mma fighter, photographer of the year. Your work is unbelieveable Jay. I love seeing your photos.